Graph of the Week: Health Care Costs - Part 2, "Unhealthy Things Not Related to the Problem"
Health Care Costs - Part 2, "Unhealthy Things Not Related to the Problem"
"American society believed that smoking was not only highly fashionable, but that is also relieved tensions and even produced health benefits." "However, epidemiologists started noticing around 1930 that lung cancer - rare before the twentieth century - had been increasing dramatically." Due to the overwhelming evidence linking smoking and lung cancer, the U.S. imposed a ban on tobacco advertising on TV and Radio while also forcing manufacturers to put a warning label on the packages. Apparently the warnings, bans, anti-smoking campaigns and perhaps common sense have led to a gradual decline in smoking. 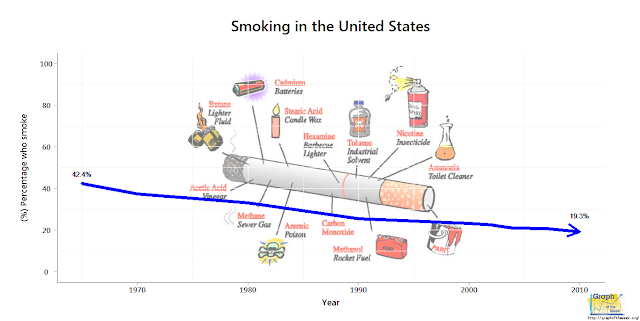 Taking a look at the above chart, around 42% of the population smoked in the early 70s. Since then, that percentage has steadily declined to its present levels around 19%. As noted in Part 1 of this series, however, average insurance rates are surpassing inflation. Unless one were to speculate on an inverse relationship between smoking and insurance rates (due to weight gain perhaps), then one must conclude that the smokers in America are not contributing to the rising costs of health care. This doesn't mean that smokers aren't paying more for insurance - they are. In essence, they fork out the extra cash to support their habit in the form of increased rates unique to them. So, if an insurance company claims that everybody's rates are higher due to smokers, feel free to point them to this article. From the data gathered here, rising insurance rates should not be related to the smoking public. There are many millions of Americans without health insurance. Going back in time to the turn of the 20th century, virtually nobody had health insurance. A number of factors could be cited for this (lack of medical advancement, low healthcare costs and perhaps the lack of need at the time), but it remains a fact. "Today in the United States the quality of one's health depends not only on his family history and how well he takes care of himself but also on whether or not he has insurance." "In general, Americans without insurance don't go to the doctor for preventative care, which means that if they have an illness, they are diagnosed when their disease is at a more advanced stage, and, finally, once diagnosed, the uninsured receive less care and die more often and sooner than people with insurance." "In fact, throughout every stage of health and disease, no matter what the type of care, including general health, mental health, dental health, and specific diseases, Americans without insurance fare worse than those with insurance, according to the National Coalition on Health Care." Don't be fooled by looking at the above graph into thinking that the number of uninsured has remained the same - it hasn't. It has increased from around 23 million in the early 70s to around 43 million today. In the same time frame, the total population has also increased from around 180 million to 260 million (which is why the percentage of uninsured has remained the same). 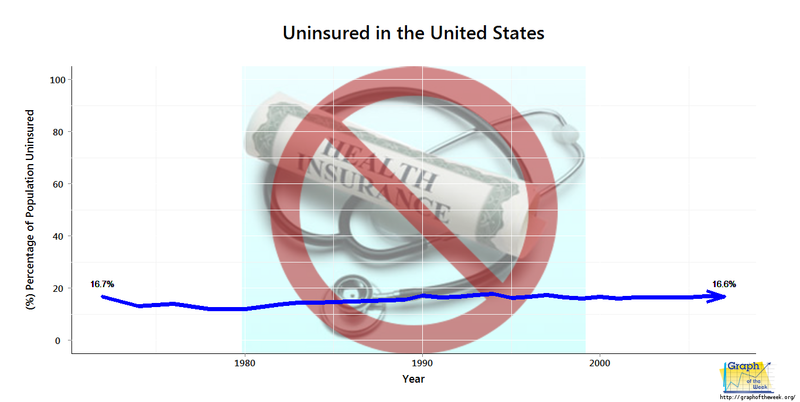 That being said, the number of those who have insurance has also increased, so all things are relatively equal. Those without insurance are going without preventative care which means they aren't a burden to the health system in that area. When something catastrophic occurs, however, is when that can change (trauma, major disease, etc.). That being said, that would have been the case in the early 70s as well so based on that criteria, the uninsured can't be attributed to rising health care costs (unless illegal immigration is taken into account which won't be discussed here). It was actually quite difficult to find non-factors in the health care debacle. Unfortunately the health care system in the United States is so complex and inter-dependent that nearly every measured variable is a player in the cause of the problem. In the next article (or perhaps more) the many factors playing into this problem will be revealed. 1) What other variables might be non-factors in the heath care problem? 2) How are the tobacco companies profits these days? 3) What country has the 'best' health care system?